During my childhood, ghosts and ghost stories fascinated me… and scared me a little, too. Apparently, our house was haunted. As an adult, I discovered that many people share my interest in paranormal phenomena, including ghosts. That’s when I became a serious researcher, and wrote articles for magazines such as Fate. Over the next few decades, I narrowed my focus. I began looking for patterns (including history) that seem to explain – and sometimes predict – why some places are haunted, and others aren’t. With friends who shared my interests, I began exploring off-the-beaten-path haunted sites. Often, we investigated those sites three or four times a week. It was a great education… and usually fun, as well. In the late 1990s, people discovered my websites. I met more wonderful people who shared these interests. In fact, that’s what I’ve enjoyed most about my work: forming friendships with people all over the world. I’m honored that you’re interested in my research, my websites, and my books. And I hope to meet you in real life, at a future conference, ghost hunting event, or investigation. For over 40 years, Fiona Broome has been an author, researcher, and paranormal consultant. Author of over a dozen books. Contributor to many more, including the “Weird USA” series and “Armchair Reader” series. Consultant and location scout for movie & TV production companies. Pioneer of techniques to predict unreported (and under-reported) paranormal sites. Celebrity Guest and speaker at Dragon Con (2006 – 2010), GhoStock (2009), Central Texas Paranormal Conference, Canada’s G.H.O.S.T.S. conferences, and the New England Ghost Conference. Research experience distinguishes Fiona’s pursuit of unexplained phenomena in everyday life. An unabashed geek, Fiona analyzes and sometimes predicts paranormal activity. She looks for reasons why some places and objects (or the people around them) seem haunted, but others don’t. Luckily (for her, anyway), she usually finds answers in history and geography. Sometimes, real history doesn’t match popular “ghost stories,” but that’s exactly why it’s important: It gives us new clues to why some sites report paranormal activity. And it tells us where to look for even more. For Fiona, the stories and personal experiences are at least as important as the physical evidence and history. And, in many cases, they work together to give us a better understanding of what “paranormal” really means. Armed with this kind of information, anyone intrigued by the paranormal world can experience it, and be part of this adventure. Fiona sold her first “ghost story” to Fate magazine in the early 1980s. Since then, she’s written or contributed to over a dozen best-selling books. She’s also been a consultant for paranormal TV shows and the stars on them. Fiona is the founder of one of the Internet’s oldest ghost-related websites, HollowHill.com. Since 2000, her sites have also included Ghosts101.com and EncounterGhosts.com, and she’s written more than 1,000 ghost-related articles for magazines and websites. Around 2015, one of Fiona’s hobby websites – about the Mandela Effect – sparked international interest. By 2016, new explorers in that field were sharing their notes & theories at Reddit and other forums. Fiona was pleased to see others take the lead in Mandela Effect research. Fiona has been a speaker and panelist at a wide range of international events including the New England Ghost Conference, GhoStock, Central Texas Paranormal Conference, and Canada’s annual G.H.O.S.T.S. conferences. From 2006 through 2010, she was an invited Guest and panelist at Dragon Con. Today, Fiona is happy to focus on ghost research, where her anomalous adventures began, back in the 1980s. For years, Fiona Broome described herself as a “blip analyst.” She’s fascinated by unexplained events and everyday anomalies. Often, this takes her into paranormal realms. Ley line patterns in ghost research. Using geographical lines (ley lines) and patterns, Fiona was the first to publicly identify sites with unreported (and under-reported) paranormal activity. She’s predicted anomalies from New Orleans’ French Quarter to Salem, Massachusetts, and from Atlanta, Georgia, to Maritime Canada. Historical patterns in general paranormal research. For Fiona, this started with her discovery of the connection between Abner Cook, Shoal Creek, and Austin, Texas’ many haunted buildings. Since then, Fiona has been the lead researcher in the historical and geographical patterns that might explain why some sites are haunted and others aren’t. Genealogy as a paranormal research tool. With over 40 years’ experience as a professional genealogist, Fiona has pioneered paragenealogy, to document (and sometimes discredit) popular “ghost stories” from the Lalaurie Mansion in New Orleans, to the enduring “curses” that followed the Salem Witch Trials. “Sparkles,” a specific camera effect. In the late 1990s, Fiona coined the term “sparkles” to describe camera phenomena that can indicate the likelihood of photo anomalies. The term has since been adopted throughout the field, and used as a predictor in paranormal investigations. Fiona’s research and her contributions to over 15 books are always based in documented facts, history and science. Online, she’s respected as the founder of Hollow Hill, which – since 1999 – is still one of the Internet’s oldest and largest websites about ghosts and haunted places. Her opinions and advice have been important in this field since her first article for Fate magazine, published in 1989 (under the pen name, Margaret Brighton). Fiona’s expertise in the field led to her being the model for the “Fiona” character in Trickery Treat, the final novel in the first Charmed TV series books. In 2003, Fiona was the opening speaker for the New England Ghost Conference. During 2006, 2007, 2008, 2009, and 2010, Fiona was an invited Guest and speaker at Dragon Con, talking about paranormal, sci-fi, and speculative topics. She was also one of the speakers, panelists and investigators at GhoStock 7 (2009). Fiona was a guest speaker and panelist in Ontario, Canada at the 1st and 2nd Annual G.H.O.S.T.S. Conference. In October 2011, Fiona was among the guest speakers and panelists at the Central Texas Paranormal Conference, in Austin, Texas. TV: Hollywood New England, Chronicle (various throughout New England), and the History Channel (History II). Radio: Coast to Coast AM (June 2018), Para-X Radio shows (several) , Blog Talk Radio (several, including Haunted 911), Darkness Radio with Dave Schrader, Psychic Sundays with Gavin Cromwell, The Spiritual View with Dr. Kevin Ross Emery, and Just Energy Radio with Dr. Rita Louise. Haunted Times magazine: Fear the Darkness of Falstaff’s Experience (Fall 2008). Phylllis Hoffman Celebrate Magazine, Haunted Happenings in Salem (Halloween 2010). NH Magazine: Nine Bone-Chilling Questions with a Granite State Ghost Hunter (Oct 2002), Unearthly Encounters (Oct 2010), Haunted Cemeteries (Oct 2012). Boston Globe newspaper, Boston, MA: Inside the T’s Tunnel of Doom (Halloween “City View,” Oct 2002). Nashua Telegraph newspaper, Nashua, NH. Encore cover story, Do you believe in GHOSTS? (27 Oct 2000), The Haunting of Tyng Mansion (31 Oct 2002), NH Ghost Hunter Reports Ghoulish Prank (12 May 2003), Spirits & Hauntings & Pukwudgies, Oh My (10 Oct 2010). Brennan’s Restaurant, New Orleans, LA. Edinburgh, Scotland’s underground vaults (6 May 1996, shortly after the opening of the vaults). The Falstaff’s Experience (also known as Tudor World), Stratford-upon-Avon, England (with Margaret Byl, Jennifer Sikes, and others). Fort Worden, Port Townsend, WA (twice, both with Z’anne Bakke). The Hawthorne Hotel, Salem, MA (with Dave Schrader, John Zaffis, and others). MBTA Tunnels, Boston, MA (with Boston Globe staff). The Mount, MA (with Gavin Cromwell, Barry Fitzgerald, Lesley Marden, Dustin Pari, and John Zaffis). The Myrtles Plantation, LA (with Margaret Byl). New England Lighthouse Tour, summer 2009 (with Gavin Cromwell, Jeremy D’Entremont, Ron Kolek, Lesley Marden, Norie Miles, David Wells, and Maureen Wood). The Salem Inn (with Gavin Cromwell and others). The Spalding Inn (multiple times, with Steve Gonsalves, John Zaffis, Jason Hawes, Grant Wilson, and others). Tenney Gatehouse, Methuen, MA (with Gavin Cromwell, Sean Paradis, and John Zaffis). USS Salem (with Carl Johnson and Dina Palazini). Because so much of Fiona’s research applies to the popular subject of ghosts, many people associate her exclusively with that field. However, analyzing haunted locations, Fiona’s studies cover a far wider base. Ms. Broome has attracted attention for her groundbreaking studies of paranormal patterns. Using history and geography as a base, Fiona is able to predict anomalies such as hauntings and UFO reports. In Austin, Texas, she discovered the connection between Abner Cook, haunted Shoal Creek, most of the major hauntings in downtown Austin, and the tragedy at the (haunted) University of Texas tower. In Salem, Massachusetts, Fiona discovered the Judges Line, a path of tragic events, crypto zoology, and hauntings related to the Salem Witch Trials. It’s one of at least two patterns researchers can use to find ghosts in the Salem and Danvers areas. In New Orleans, Fiona uncovered a little-known tragedy from the colonial era. Its community-wide impact connects almost every haunting in the French Quarter, and adds a startling perspective on why specific downtown New Orleans areas flooded during Hurricane Katrina. Ms. Broome is the world’s top paragenealogist. Drawing on over 40 years’ experience, Fiona uses historical and genealogical resources to uncover reasons why certain locations — and people — trigger more paranormal activity than others. Fiona goes beyond folklore to dig deep into eerie and paranormal events… and the chilling history-based facts that explain why they occur. No child was poisoned at The Myrtles Plantation, but there’s far more to The Myrtles’ hauntings than the history of a vindictive servant. And, there may be a very troubling reason why people so clearly hear strange things at The Myrtles, at night. No servant leaped to her death from the third floor of New Orleans’ “haunted mansion,” also known as the LaLaurie Mansion. However, two of Madame LaLaurie’s nearby residences may be even more haunted. Though it may seem like fiction, The Hound of the Baskervilles was based on a real spectral hound that is still sighted in locations across England. Even more strange, it’s tied to a particular family with a wealth of bizarre paranormal reports. As a consultant, Fiona has worked with many psychics and paranormal researchers, and at haunted locations to document the facts — and fiction — behind popular ghost stories, UFO reports, and anomalies that seem to echo popular sci-fi TV shows. 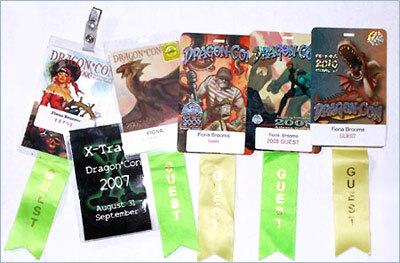 Over several years, Fiona engaged in fascinating discussions in the Dragon Con “green room.” There, people shared their clear memories of Nelson Mandela’s death while he was in prison, among other “events that never happened.” Fiona and Shadow (Dragon Con security manager) coined the term “Mandela Effect” to describe the phenomenon. In 2009, after returning home, Fiona launched a related, hobby website, MandelaEffect.com. She was astonished when, in 2015, a surge of visitors affirmed that many people have a wide range of memories that conflict with our present reality. In recent years, others with more resources have continued to explore this topic, and share their discoveries at sites like Reddit. Fiona does not participate in those discussions. Fiona has taught Ghost Photography since the 1990s. Her book, Ghost Photography 101, documented the potential for false anomalies in settings with high humidity, dust, smoke and other problems. This book also explored new and unusual opportunities for researchers to photograph orbs and other evidence of ghosts. Fiona is the author of over a dozen books, hundreds of articles online and in magazines, and has contributed to many anthologies of ghost stories. Her publishers include Publications International, Schiffer Books, Sterling, Usborne, and DK, West Side Publishing, as well as several indie imprints. Fiona’s YouTube channel features videos about ghost hunting, the Mandela Effect, and more. More comfortable away from cameras, Fiona has been an occasional podcaster since 2006. Fiona Broome is very protective of her privacy. She grew up in the Boston (MA, USA) area, and spent much of her childhood at M.I.T., where her grandfather was a consultant. In her 20s, she moved to California for a career in modeling, but was soon distracted by other things. Her fondest Los Angeles memories include working with Bjo Trimble on the early Star Trek conventions, setting up meeting room chairs with Bill Campbell, and taping down electrical wiring with Jimmy Doohan. Fiona’s first book was published in 1977, under a pen name. Additional books followed with traditional and indie publishers. In 1982, she was one of the coordinators of the first annual Mensa Colloquium in Boston, MA. Fiona is a happily married mother of three children. She’s equally at home in the U.S., the U.K., and Ireland. In her spare time, she paints landscapes, bakes cookies, travels (a lot), and enjoys Shakespeare plays. Fiona expected to be a stay-at-home mom. Instead, her path has led in other directions, and given her many tales to tell audiences, as well as her grandchildren.